"James , thank you for taking time out of the busy promotion schedule to talk to me today. As you can imagine I watch a lot of horror films yet Curse of the Witching Tree is one of the most effective and scary films I have seen for a while. Where did the idea come from and what was your vision for the film? I really wanted to go back and create the sort of horror films I loved growing up when I was little, and inspired me to want to go into making films. So I suppose the vision of the film was to create something very traditional and British. It’s still been modernised of course, but it’s more a return to the more traditional style of film making. I think you can see the love of Hammer Horror in it for instance. And I’m really proud about that. I think I’ve always had a fascination with witchcraft and that dark period of history. Reading lots of those stories of real life atrocities to do with Witchcraft as a kid, really got under my skin. Once I had the idea I wanted to do a revenge film, born out of that horrifying medieval time... it all sort of fell into place. There was just so much material and inspiration to work with. And hopefully Curse of the Witching Tree is also a very Gothic tragedy. I love the concept of a family rocked by deep trauma being subjected to an age old curse which deepens their torment. Your direction was neither heavy handed and the shocks and build up were slow burn. What was your reasoning for going down a more psychological route? To me all the best horrors are psychological ones, because that’s what horror films are… fun psychological torture that in a weird way we use as therapy. I have always been very interested in psychology and I think that has found it’s way into my writing. The whole story I think sees a real mix of characters suffering mental issues and torment. The Thorson’s and Isobel Redwood are both tormented by an injustice that is out of their control and undeserving. All the characters are really exposed to psychological torture, both internal or external, alive or dead. I hope the films horror rises out of that and people feel that. You have commented that the casting for Witching Tree was one of the best you've ever made. I would agree that the performances were absolutely sublime, can you talk me through how the film was cast? I’d worked with both Lucy and Sarah before and I felt I had a really good connection with them. In fact virtually all the cast I’d worked with before. Minus a few people such as Jon Campling and Dean Maskell, who instantly loved the script. As actors they seem to get my style of writing and it was really nice working with actors who get your vision. I tried not to always cast stereotypically too, like in the case of the witch with Danielle Bux. It was important for me I think to have a very ethereal woman playing the role, and she was great as the witch. It took a while to find the special kind of kid we needed to play Jake, but Lawrence really stole the part I think. He had great vulnerability. I learnt to cast from all my short films and I’ve learnt I think to spot actors who I’m on the same page with. 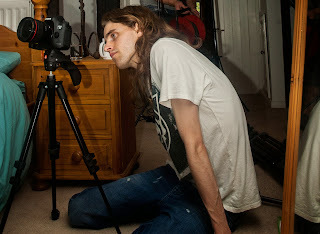 Once you're working with actors who you connect with,as a director, and understand you, it all becomes a lot easier. I think I was really lucky, and got just that with all the cast on this film. You have a great understanding of the horror genre, can you talk me through your early memories of horror films? I loved a lot of Alfred Hitchcock and also black and white movies like the original The Haunting and The Innocents from a young age. Which was rather odd I guess, as most people around the same age weren’t. I think a big turning point for me was seeing Suspiria late one night as a teen on Channel 4. Incidentally, another witch film. That’s when I think I made the leap to go from writing horror stories and wanting to bring them to life with cameras. I have a very deep love of horror films with fairytale sort of elements. Especially the classics. I don’t see them in the same terms a lot of other people do. I see them as dark fairy tales. And from a creative viewpoint, the genre makes the most of cinematography, sound, lighting, editing, effects and everything really. It’s like having a canvas and the full paint set to go wild with as a filmmaker. Curse of the Witching Tree has a wonderfully effective soundtrack. What influenced your decisions around this? Again, all the classic films I loved had great soundtracks. I even played Pete Coleman some music from Suspiria actually. I know it’s cliché, but even things like Tubular Bells in The Exorcist. I was obsessed with that tune and also Jon Carpenter’s films. Especially The Fog. We worked a long time on the music, and I think I drove Pete a bit mad! But he really got it, and I think it was worth the work. Horror films are made or broken in my opinion on the soundtrack. It’s very important. Sound design too. Sounds and music are very powerful, and I made sure we didn’t rush it. Pete really got that traditional horror film feel and really gave it that extra class it needed in my opinion. What are your plans for future projects and can we expect more in the horror genre? Oh yes! There will be more horror films! I am thinking of other genres, but horror and fantasy is where my heart is. Although I think you can bring elements of horror and fantasy to any genre too. I’m hoping to enter pre-production very soon on the second feature film and we have begun talks with some exciting actors. It’s another horror film that I have written on my own, and it’s an idea I have had for many years now. I can't say much more at the moment, but I always like to make sure there is a twist on the genre somewhere. I feel like this is one of the best scripts I’ve written and I’m extremely excited some great people are getting behind it with me. There’s a really good feeling at the moment that exciting things are ahead. Needless to say we will be sticking to the traditional style of horror. And that’s what also excites me. 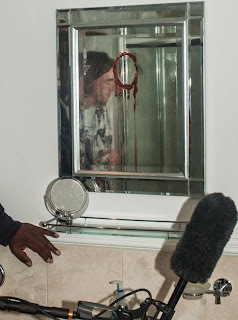 We’ll be heading out again shortly to make the best horror film we can. 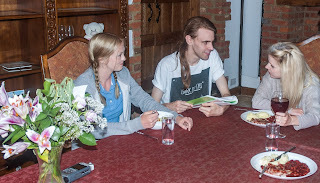 Thanks for your time and I would love to keep in touch"
Curse of the Witching Tree is out on Monday and you can preorder your copy from Amazon or pick up a copy from Sainsburys and Asda in the UK or from Walmart and Target in America. 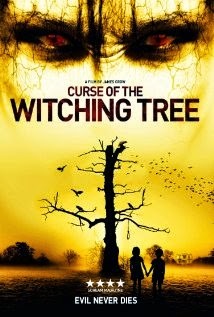 Curse of the Witching Tree is also available to download from iTunes.